Is Nate the Next Denzel? Nate Parker was born in Norfolk, Virginia on November 18, 1979 to a 17 year-old single-mom who never married his biological father. He and his younger sisters were raised mostly in Bath, Maine which is where his stepfather was stationed by the U.S. Air Force. Nate only started acting after graduating from the University of Oklahoma, when he was spotted by a talent scout while waiting for a friend at an audition. Signed by an agent, Parker immediately moved to Los Angeles where he soon landed work in commercials and bit parts on several TV shows before he found his breakout role as Hakim in the desegregation drama Pride. He has since starred in other sagas with civil rights themes such as The Great Debaters and The Secret Life of Bees, and later this year he'll be playing a Tuskegee Airman in the WWII epic Red Tails. 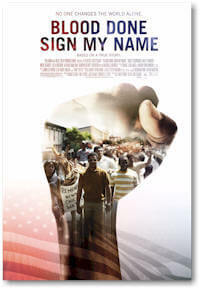 Here, Nate talks about his current release, Blood Done Sign My Name, a bio-pic about the rise to prominence of a young Ben Chavis, who went on to become Chairman of the NAACP, in the wake of a lynching in North Carolina. He also discusses his preference to make socially-significant projects. Kam Williams: Nate, thanks so much for the time. Nate Parker: Of course, any time, brother. 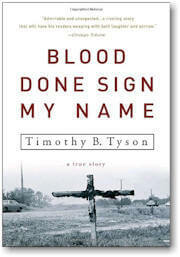 KW: What interested you in doing Blood Done Sign My Name to play an important civil rights figure like Ben Chavis? NP: To put it plainly, it was the fact that it fit my model. I prefer to make movies which not only have a message for "then" but a message for "now." Here was this 22 year-old brother who had no idea what was about to happen, and yet, when it did, he stepped into it in a way which changed an entire community. There was leadership and a sense of accountability in this young man, and those are qualities I can talk about in 2010. So, when I read the script, I knew that it could serve as a tool in the present for some of what ails our community. Tim Tyson's riveting narrative of that fiery summer brings gritty blues truth, soaring gospel vision, and down-home humor to a shocking episode of our history. Like To Kill a Mockingbird, Blood Done Sign My Name is a classic portrait of an unforgettable time and place. NP: I read everything I could about the period, including the book the film is based on. The book was incredible because it deals with racism, white supremacy and the black inferiority complex in a real way, and it illustrates how they can be a cancer on a community. KW: And how does that relate to today? NP: I look around today, and I see the Prison-Industrial Complex, and how 50% of our brothers and sisters are behind bars, and how half of us are dropping out of school. And I look at the escalating HIV rate in the black community. These are issues now, and we need leaders to address those crises in the way that Ben Chavis was effective at inspiring a whole generation of kids. KW: Is it true that your showbiz career got started when you were spotted by a talent scout? NP: Yeah, I was working in computers when this stranger approached me out of the blue, saying I should become an actor. I took it as a gift from God, because I had been praying for clarity about what He wanted me to do, since I wasn't happy in computers. So, I gave my employer notice, and moved to L.A. in two weeks. It was definitely Divine intervention. And six year's later, here I am, and Jon Simmons, the guy who signed me up, is still my manager. KW: Praise the Lord! I guess you were surprised by your meteoric rise, huh? NP: It's been surprising in the sense that it happened so quickly. But I'd say it's been more of a blessing than a surprise because I believe it was God's plan to give me this platform. That's where my passion comes from, to use it to benefit people, especially people from my community. KW: Why are these message movies you make so important? NP: Because the way in which we were disconnected from our continent has left us in this limbo when it comes to identity. Our community lacks a rite of passage that you see in so many other cultures, that celebration where you're surrounded by other people who look like you explaining to you what it means to be a person of African descent coming of age. When I was young, to have a big nose, big lips or dark skin was the worst. You were the wretched. That was something I not only felt, but I participated in. Unfortunately, I was put down for my big lips and nose, and I would join in teasing others about their darker skin. That's why I believe the first step we need to take to change our community is in identity, in learning who we are and why we are. In understanding the struggles we went through in Africa, the strength that it took to endure the Middle Passage, and the struggles we're going through now. 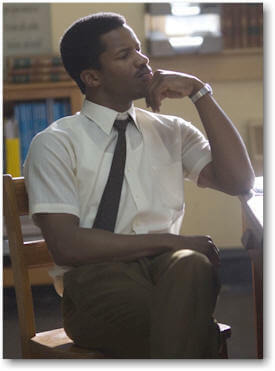 KW: In seeing all the civil rights movies you make, it seems like you're consciously picking socially-relevant projects. NP: Absolutely! My community has to come first. How we feel about and what we're willing to do for our people has to be imbedded in our very bones. When dealing with our people, we don't have the luxury of treating it like a hobby. KW: There comes a stage in every black actor's career where Hollywood forces him to put on a dress and act the fool. How have you been able to avoid that? NP: Through the grace of God who gave me this opportunity. I have to acknowledge Him as the one that has blessed me, and I put my faith in Him. Will I explore other genres? Definitely, but like I said, my community has to come first. I know this attitude is rare, especially in a capitalist society where we're encouraged to stay away from the ghetto if you make it out. Sadly, black people disassociate ourselves from the things which make us who we are, identifying them as lesser, or inferior. It's a form of self hate. So, with reckless abandon, we strive to be like the majority. KW: Is there any question no one ever asks you, that you wish someone would? If so, please answer it. NP: Wow, that's a great question! I want young people to ask me if I'm serious. Our young people have been lied to and misled for so long. When I stand on this soapbox, I want young people to ask me that because once they know I'm serious, they'll be willing to ride with me. NP: Yes, sometimes. My mother always tells me, "Fear isn't from God," and I believe that. But sometimes, I wonder whether I'll be able step into the shoes that God has prepared for me. NP: Very happy! I'm happy with who I am, but I'm not happy with where we are yet. NP: [Laughs] Hanging out with [co-star] Lela Rochon about an hour ago. She's such a character. KW: "Realtor to the Stars" Jimmy Bayan's question: Where in L.A. do you live? NP: I'm actually in the process of moving to Torrance to be closer to my daughter. Imagine America on the first day of the 21st century. At the break of dawn, a thousand space ships descend from the sky, landing on the shores of the East Coast, bearing treasures of gold, safe nuclear power and detoxifying agents that could pay all debts and save the earth's environment. In exchange for these goods, guaranteed to rescue America from the excesses of its past, the Space Traders want just one thing -- to take all African Americans back to their home star. What would our leaders do? White Americans were once capable of rationalizing Black slavery; would they be capable of justifying the trade of all African Americans to space, to improve their own lot on earth? The situation is a chilling fantasy. But for Derrick Bell, the prominent civil rights activist and former Harvard Law School Professor, the danger is very real. 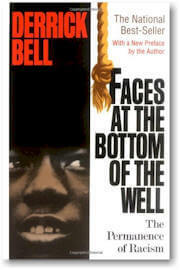 In Faces at the Bottom of the Well: The Permanence of Racism, Bell uses allegory and historical example to argue that racism has always been an integral, permanent and indestructible component of American society. NP: Faces at the Bottom of the Well by Derrick Bell. NP: I'm listening to a mixture of Maxwell, Robin Thicke and Alicia Keys. KW: Speaking of Alicia Keys, Larry Greenberg says, "When I saw you with Alicia Keys in the Secret Life of Bees, I was convinced there was chemistry between you. Was I right, or are you two just great actors?" And he adds, "You can be honest. Don't worry, Sarah [Nate's wife] isn't going to read this." NP: [LOL] Oh my gosh, that's hilarious! I think chemistry and great acting go hand-in-hand. We are great actors, so of course there was chemistry. We allowed ourselves the vulnerability to have an authentic relationship in the sense of the characters. We called each other by our characters' names the entire time we were shooting the film. KW: Eleanor Boswell-Raine, who is the daughter of the Reverend Hamilton Boswell, one of the real Great Debaters, wants to know whether you're planning to do anything with Wiley College. NP: Tell her I just awarded six Nate Parker Scholarships to Wiley students last week when I was there to deliver the keynote speech at the 100 Men of Excellence Leadership Conference. KW: Laz Lyles asks, what other charity work do you do? NP: I also deal with a program called Peace for Kids in Compton. And with my mentor, I started a group in Bed-Stuy, Brooklyn called Leadership and Literacy through Debate. NP: Wow, that's a deep question… It just hit me. My mother was a single parent. She didn't have enough money to support us, so we lived in my grandmother's house with my other aunts and uncles. My earliest memories are, when I was about 3 or 4, of waiting for her to come home from working at BJ's. She worked double-shifts, so she didn't get home until about 10 PM at night. NP: My best friend was Marcus Johnson. We grew up together. I brought him to college with me. He didn't have all the opportunities that I had, but I tried to keep him close as a constant reminder of how blessed I've been. NP: Being a father to my two daughters. NP: To take the steps, and to believe. KW: Well, thanks again, I'm happy that I finally got a chance to chat with you, after interviewing so many of your co-stars: Alicia in The Secret Life of Bees; Jurnee and Denzel in The Great Debaters; and Terrence Howard in Pride. NP: I'm happy you did, too. 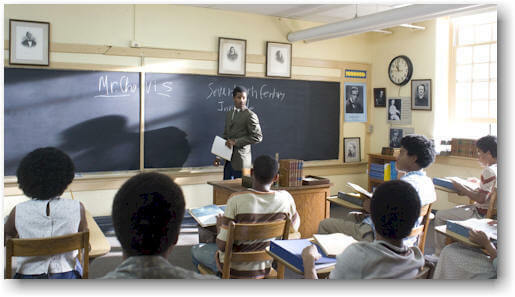 KW: I'm looking forward to speaking with you about Red Tails when it gets released next Fall.